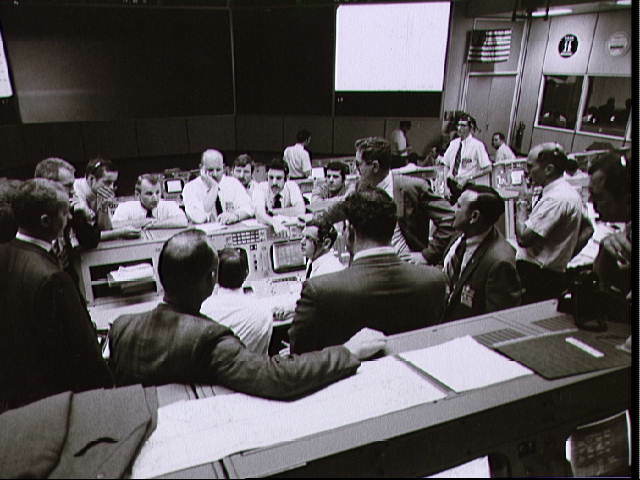 Overall view showing some of the activity in the Mission Operations Control Room (MOCR) of the Mission Control Center (MCC) during the final 24 hours of the Apollo 13 mission. Here, flight controllers and several NASA/MSC officials confer at the flight director's console. When this picture was made, the Apollo 13 moon landing had been cancelled and the Apollo 13 crewmen were in transearth trajectory attempting to bring their crippled spacecraft back home (35368); Discussion in the MOCR dealing with the Apollo 13 crewmen during their final day in space. From left to right are Glynn S. Lunney, Shift 4 Flight Director; Gerald D. Griffin, SHift 2 Flight Director; Astronaut James A. McDivitt, Manager, APollo Spacecraft Program, MSC; Dr. Donald K. Slayton, Director of Flight Crew Operations, MSC; and Dr. Willard R. Hawkins, M.D., Shift 1 Flight Surgeon (35369).